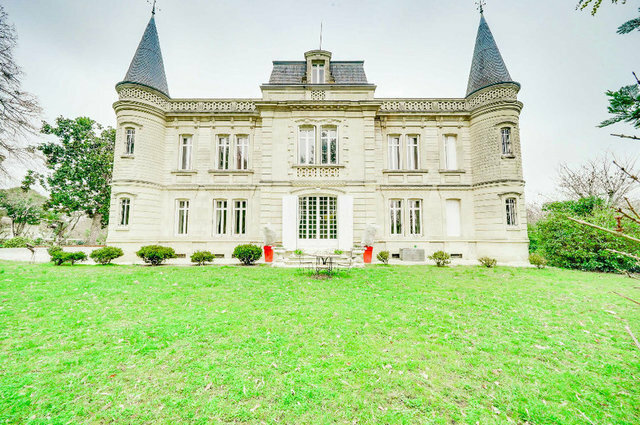 This elegant property, built in 1900, is located only 35 minutes from the centre of Bordeaux and offers an impressive display of period features: high ceilings, moldings, marble fireplaces, parquet floors and wood paneling. The grounds extend to almost 1.8 hectares and offer a haven of tranquility hidden from view with a river, waterfall and vast swimming pool. The château of 450m2 comprises: Ground Floor: a beautiful entrance hall, 3 reception rooms, a bedroom with wash-room and a kitchen with views of the river and waterfall. Lower Ground Level: 2 vast reception rooms giving access to a terrace and swimming pool, a summer kitchen, a wine cellar, a laundry room and bathroom. First Floor: 4 bedrooms (2 with private wash-room), 2 bathrooms and storage. Second Floor: 2 bedrooms with sink and storage area. The dependancies include a 3 bed guest house, a garage, a 13th century lookout tower, an ancient watermill and stone cellars. A village with shops and services is accessible on foot. Exceptional property in a stunning environment. dont 4.32 % honoraires TTC à la charge de l'acquéreur.